Whoa, far out! 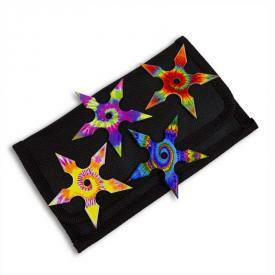 The Trippie Hippie Throwing Knife Set is exploding with vibrant colors and patterns. A lethal weapon never looked so boss. These retrofuturistic throwing knives have a bright, classic color scheme element that makes them stand out. This set of 4 kunai features unique and colorful tie dye designs that will remind you of your favorite subculture of the 1960s and 1970s. 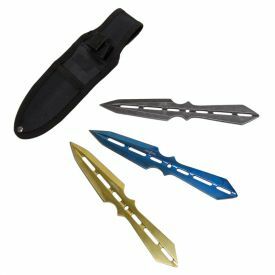 Whether you are a retired Baby Boomer looking for some nostalgia or a millennial looking for something to appreciate ironically, these tie-die throwing knives are sure to brighten your day. 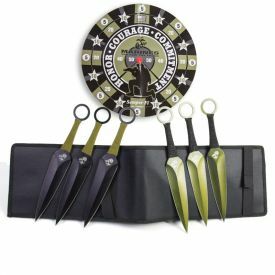 Never have the awesome hippie style and the amazing power of throwing knives been combined. Forged from the ever so powerful stainless steel, this kunai set is battle ready. But then again, why wage war when you can wage peace? The 4.5" blade has a 3mm tapered edge that is optimal for slicing through the air and puncturing your targets. The cord wrapped handle offers a generous amount of comfort and grip. 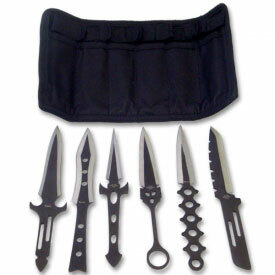 This kunai fun pack comes with a fantastic nylon sheath. 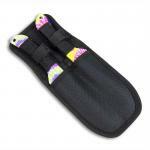 The sheath has four compartments and straps that safely and comfortably secure your throwers. 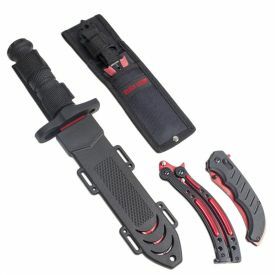 And if that wasn't enough, the sheath has a belt loop that lets you easily access your throwing knives on the go! These hippie throwing knives are absolutely groovy. Order yourself a set before you miss out and flip your wig.